Cool features of the real thing, including a motorized front power arm for up/down motion and Hyper-Lighting. Allows you to smash the trash and open the back door for access. Levers on the side control the front power arm and sounds the horn. Made from a sturdy, high quality plastic, this fire engine is perfect for indoor play. Builds 56 Motorized models or create many more of your own. 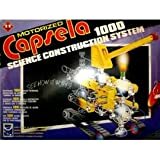 Capsela Parts are interchangeable with other Capsela sets. Great detail on each character. No. 350 Water Toy Building Set. 28 Interlocking parts. Build 8 or more action projects.